MIT is known for engineering and computer science departments that are second-to-none. Fewer prospective students are aware of the Institute’s world-class academic programs in other fields, including economics, biology, and political science. 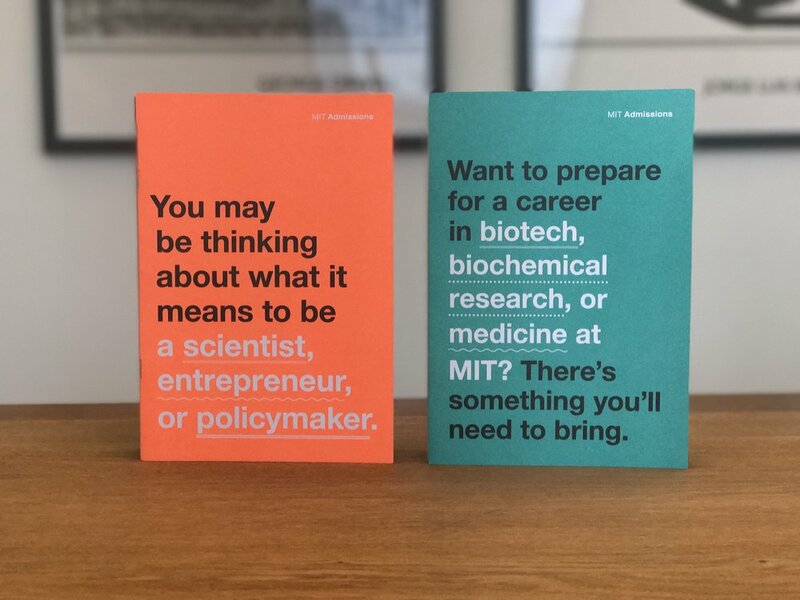 To help shed light on these exceptional – and under-appreciated – majors, the MIT admissions team asked Libretto and Moth Design to develop targeted recruitment materials to appeal to top candidates. We divided these diverse majors into two groups we titled “social sciences” and “biological and chemical studies.” For each piece, we chose a humanistic overarching concept that injected a sense of playful personality, which subverted reader expectations and appealed to students interested in these areas. To further counter perceptions of MIT as a no-nonsense engineering school, we created vibrant covers with bold statements that are paid off by the opening spread headlines. We planned to include profiles of students, alumni, and faculty members that would help bring the personal side of the Institute to life, but shooting photography was out of our budget. Instead we developed the idea of the “Power of 10.” This technique paired each academic program with ten stories from members of the MIT community. As a final creative twist, our team divided both of the pieces into “back-to-back” brochures that could be read from either end. With one half focused on the programs and the other on the ten people who taught or studied them, we delivered an unexpected, interactive reading experience that offered vital information and human interest.